When the November rut comes around each year this can be a familiar scene. Two bucks sparring another buck waiting for his chance and of course "The Winner Takes All". 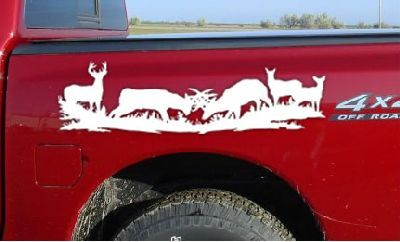 This great decal will make a huge statement on any Whitetail Hunter's rig, tag one today. 28" X 8" in size. 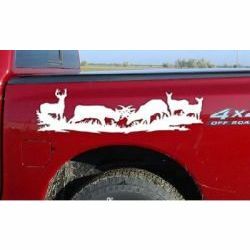 These Big Game Hunting vinyl decals and stickers are for display on trucks, cars, trailers, boats, gun cases & other smooth surfaces.